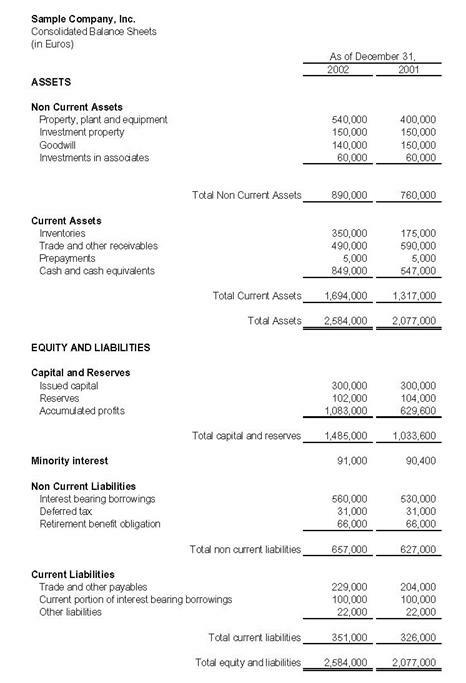 In financial accounting, a balance sheet or statement of financial position or statement of financial condition is a summary of the financial balances of an individual or organization, whether it be a sole proprietorship, a business partnership, a corporation, private limited company or other organization such as Government or not-for-profit entity. Assets, liabilities and ownership equity are listed as of a specific date, such as the end of its financial year. A balance sheet is often described as a "snapshot of a company's financial condition". Of the four basic financial statements, the balance sheet is the only statement which applies to a single point in time of a business' calendar year. A standard company balance sheet has two sides: assets, on the left and financing, which itself has two parts, liabilities and ownership equity, on the right. The main categories of assets are usually listed first, and typically in order of liquidity. Assets are followed by the liabilities. The difference between the assets and the liabilities is known as equity or the net assets or the net worth or capital of the company and according to the accounting equation, net worth must equal assets minus liabilities. Another way to look at the balance sheet equation is that total assets equals liabilities plus owner's equity. Looking at the equation in this way shows how assets were financed: either by borrowing money (liability) or by using the owner's money (owner's or shareholders' equity). Balance sheets are usually presented with assets in one section and liabilities and net worth in the other section with the two sections "balancing". A balance sheet summarizes an organization or individual's assets, equity and liabilities at a specific point in time. Two forms of balance sheet exist. They are the report form and the account form. Individuals and small businesses tend to have simple balance sheets. Larger businesses tend to have more complex balance sheets, and these are presented in the organization's annual report. Large businesses also may prepare balance sheets for segments of their businesses. A balance sheet is often presented alongside one for a different point in time (typically the previous year) for comparison. 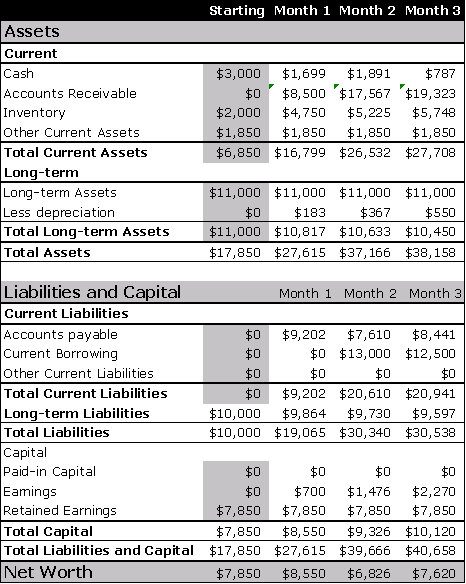 A personal balance sheet lists current assets such as cash in checking accounts and savings accounts, long-term assets such as common stock and real estate, current liabilities such as loan debt and mortgage debt due, or overdue, long-term liabilities such as mortgage and other loan debt. Securities and real estate values are listed at market value rather than at historical cost or cost basis. Personal net worth is the difference between an individual's total assets and total liabilities. A small business balance sheet lists current assets such as cash, accounts receivable, and inventory, fixed assets such as land, buildings, and equipment, intangible assets such as patents, and liabilities such as accounts payable, accrued expenses, and long-term debt. Contingent liabilities such as warranties are noted in the footnotes to the balance sheet. The small business's equity is the difference between total assets and total liabilities. Guidelines for balance sheets of public business entities are given by the International Accounting Standards Board and numerous country-specific organizations/companies. The standard used by companies in the USA adhere to U.S. Generally Accepted Accounting Principles (GAAP). The Federal Accounting Standards Advisory Board (FASAB) is a United States federal advisory committee whose mission is to develop generally accepted accounting principles (GAAP) for federal financial reporting entities. Balance sheet account names and usage depend on the organization's country and the type of organization. Government organizations do not generally follow standards established for individuals or businesses. If applicable to the business, summary values for the following items should be included in the balance sheet: Assets are all the things the business owns. This will include property, tools, vehicles, furniture, machinery, and so on. Biological assets, which are living plants or animals. Bearer biological assets are plants or animals which bear agricultural produce for harvest, such as apple trees grown to produce apples and sheep raised to produce wool. Formally, shareholders' equity is part of the company's liabilities: they are funds "owing" to shareholders (after payment of all other liabilities); usually, however, "liabilities" is used in the more restrictive sense of liabilities excluding shareholders' equity. The balance of assets and liabilities (including shareholders' equity) is not a coincidence. Records of the values of each account in the balance sheet are maintained using a system of accounting known as double-entry bookkeeping. In this sense, shareholders' equity by construction must equal assets minus liabilities, and thus the shareholders' equity is considered to be a residual. Balance sheet substantiation is the accounting process conducted by businesses on a regular basis to confirm that the balances held in the primary accounting system of record (e.g. SAP, Oracle, other ERP system's General Ledger) are reconciled (in balance with) with the balance and transaction records held in the same or supporting sub-systems. Balance sheet substantiation includes multiple processes including reconciliation (at a transactional or at a balance level) of the account, a process of review of the reconciliation and any pertinent supporting documentation and a formal certification (sign-off) of the account in a predetermined form driven by corporate policy. Balance sheet substantiation is an important process that is typically carried out on a monthly, quarterly and year-end basis. The results help to drive the regulatory balance sheet reporting obligations of the organization. Historically, balance sheet substantiation has been a wholly manual process, driven by spreadsheets, email and manual monitoring and reporting. In recent years software solutions have been developed to bring a level of process automation, standardization and enhanced control to the balance sheet substantiation or account certification process. These solutions are suitable for organizations with a high volume of accounts and/or personnel involved in the Balance Sheet Substantiation process and can be used to drive efficiencies, improve transparency and help to reduce risk. Balance sheet substantiation is a key control process in the SOX 404 top-down risk assessment. The following balance sheet is a very brief example prepared in accordance with IFRS. It does not show all possible kinds of assets, liabilities and equity, but it shows the most usual ones. Because it shows goodwill, it could be a consolidated balance sheet. Monetary values are not shown, summary (subtotal) rows are missing as well. Under IFRS items are always shown based on liquidity from the least liquid assets at the top, usually land and buildings to the most liquid, i.e. cash. Then liabilities and equity continue from the most immediate liability to be paid (usual account payable) to the least i.e. long term debt such a mortgages and owner's equity at the very bottom. Consolidated Statement of Finance Position of XYZ, Ltd.
Wikimedia Commons has media related to Balance sheets. ^ Williams, Jan R.; Susan F. Haka; Mark S. Bettner; Joseph V. Carcello (2008). Financial & Managerial Accounting. McGraw-Hill Irwin. p. 40. ISBN 978-0-07-299650-0. ^ Daniels, Mortimer (1980). Corporation Financial Statements. New York: New York : Arno Press. pp. 13–14. ISBN 0-405-13514-9. ^ "US Small Business Administration sample spreadsheet for a small business". Archived from the original on 2007-07-15. Retrieved 2003-08-10. ^ "Microsoft Corporation balance sheet, June 30, 2004". Microsoft.com. Retrieved 2012-10-04. ^ "International Business Machines "Global Financing" balance sheet comparing 2003 to 2004". Ibm.com. Retrieved 2012-10-04. ^ "Balance sheet comparing two year-end balance sheets". Retrieved 2012-10-04. ^ "Balance sheet comparing two year-end balance sheets". Archived from the original on 2007-10-19. Retrieved 2010-05-08. ^ "Personal balance sheet structure" (PDF). Archived from the original (PDF) on 2008-03-07. Retrieved 2010-05-08. ^ "Personal balance sheet structure". Archived from the original on 2007-11-19. Retrieved 2010-05-08. ^ "Presentation of Financial Statements" International Accounting Standards Board. Accessed 24 June 2007. ^ Epstein, Barry J.; Eva K. Jermakowicz (2007). Interpretation and Application of International Financial Reporting Standards. John Wiley & Sons. p. 931. ISBN 978-0-471-79823-1. ^ "IFRS VS GAAP: BALANCE SHEET AND INCOME STATEMENT" (web). Accounting-financial-tax.com.